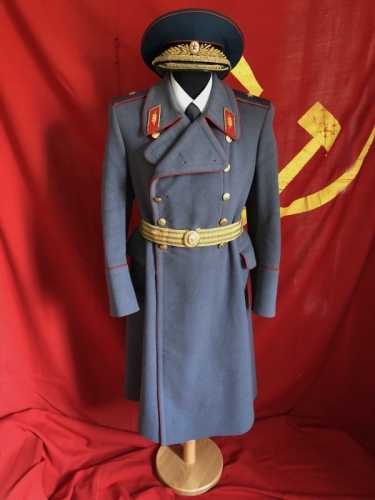 M/1954 dress winter coat for a major general of the Soviet armed forces. This wool coat was introduced in 1954 for all general and marshal ranks and authorized to wear with gray shoulder boards in the 1959 regulations. Prior to this year, the shoulder boards for these coats were golden parade boards. The coat is the classic heavy winter coat intended for use at parades and daily duty alike. The coat features red piping along the collar and around the sleeves. The collar tabs are red with embroideries for general rank. The shoulder boards are gray with one golden bullion star for the rank of major general. The buttons are 1946-1956 type with 16 republics in the state seal. All buttons are present, including those on the back of the coat. The wearers right board allows for the shoulder strap of a web belt to be run underneath the board. The lining is soft silk and is in very good condition with only light wear. Needless to say, the lining of this uniform reflects the high rank and the exclusiveness of uniforms of the 1950s. Overall, the coat is in very good condition and shows light wear. Some of the buttons have been re-sewn. The size for the coat is abuot 54 although no size is given. The belt can be added optionally, please inquire. We may also be able to get the proper leather web belt. The visor cap is not included.